Are you interested in advertising on EU-Startups.com? With EU-Startups you’ll reach a startup-interested and tech savvy audience from all over Europe. Our readers are aspiring entrepreneurs, technical talent, corporate innovators, angel investors and venture capitalists. Some Numbers: Every month, EU-Startups.com generates about 150,000 visits and roughly 390,000 page impressions. EU-Startups currently counts 26,600 Twitter followers and 22,200 Facebook fans. Our monthly newsletter goes out to more than 31,000 subscribers. Advertising Options: We offer a huge variety of effective advertising solutions such as native advertising (sponsored articles), banner ads, event sponsorings and many more. Become a sponsor and support independent media. But more important: Reach your future customers! 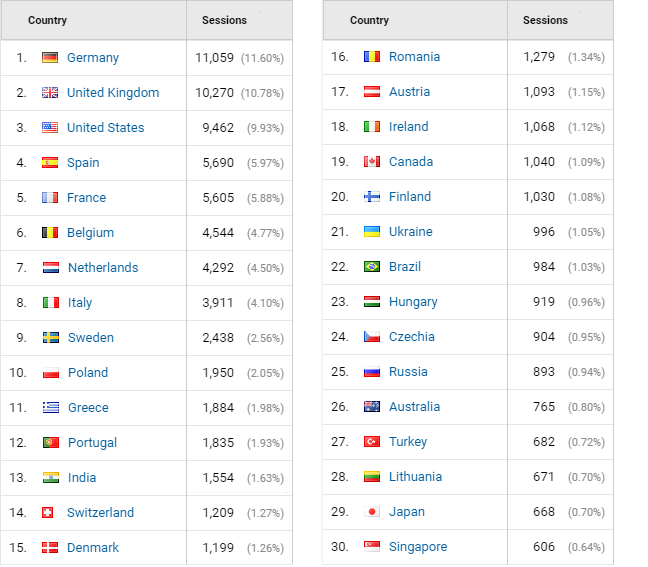 Where our readers come from: TOP 30 countries – based on roughly 95.000 monthly visits. The country ranking below is based on recent Google Analytics data.